Sealegs is something of a Kiwi success story, combining what seems like an unlikely combination of technologies into a boat that is globally unique. Despite many early naysayers, Sealegs has triumphed and they now sell their boats throughout the world, including the lucrative North American market. 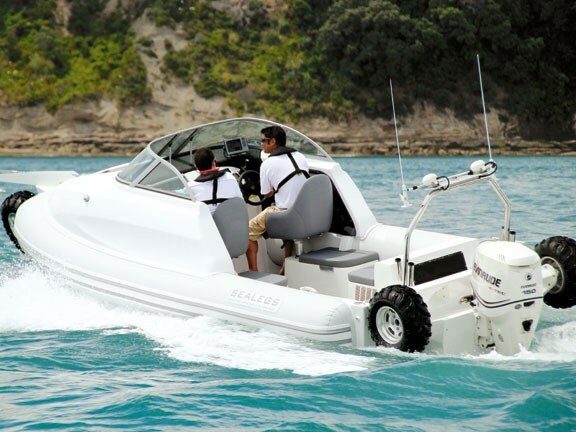 Ever since the first production boat was launched in 2004, the Sealegs concept of a truly amphibious boat has faced some serious challenges. Adding wheels to a seagoing boat is no easy task and the company has had to solve numerous technical and commercial challenges. In the process, it has collected a fair swathe of international patents for their technology and received international acclaim along the way. Past and present The initial versions of the Sealegs were based around a centre console pontoon layout with a 6.1m overall length. These were ahead of their time for the recreational fishing market as soft-bait fishing had not yet become popular. However, they were perfectly suited to the important workboat market. 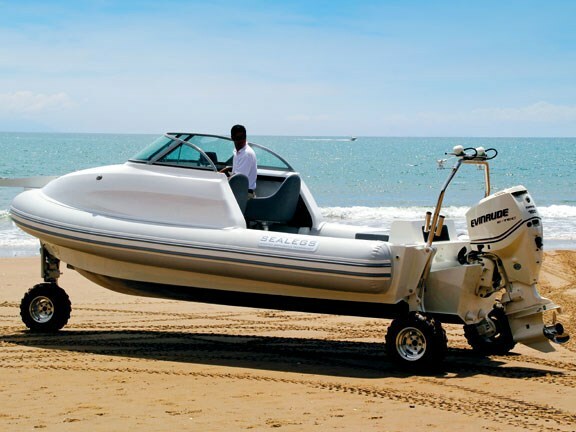 While the company was engrossed in perfecting its hydraulic-drive technology, this design suited them well and they have produced several variations since, including the 7.1m RIB, a rigid D-pontoon version and, added in 2010, the all-wheel-drive propulsion system. Now that Sealegs has an established brand and technology that is proven to be reliable, it can turn attention to alternative designs that better suit the needs of the recreational boat market. The cuddy cabin version is the latest configuration from Sealegs, and it looks like a winner. Simplicity at its best Due for public launch in March, we were invited to review the prototype model. Most boat tests require complex logistics, with photo boat, towing vehicles and boat ramps all needing to be coordinated. The Sealegs test, on the other hand, was probably the easiest we have ever attended; we simply arrived at the location, climbed into the boat and drove into the sea. The boat was parked under a flowering Pohutukawa tree on Stanmore Bay's beautiful wide beach when we arrived, and this perfectly summed up what the boat is all about: take it anywhere and launch from any beach or shallow rocky shore. Passengers can step aboard while keeping their feet dry and it is easy to load any gear without having to worry about the boat bouncing around at the same time. The 12-inch-wide balloon tyres, adapted from all-terrain vehicles, can drive up a slope with a one-in-four gradient and easily cope with soft sand and shingle. The boat is capable of driving over steep drop-offs and through obstacles that would prevent even a tractor from launching a conventional boat from a trailer. Up close and personal Before getting into the water, we had a close look at the new model. Featuring the now standard all-wheel-drive, it is clear that the hydraulics driving the wheels are seriously well-made pieces of engineering. There are no electrics anywhere near the water, with hydraulic pressure driving fully-sealed units through stainless hubs on each of the three wheels. This ensures minimal maintenance requirements and ultra-reliability. The boat itself retains the basic RIB concept, although this is a completely new version with an overall length of 7.7m. The Hypalon inflatable tubes contain six separate chambers, while the hull is constructed of 5mm marine-grade aluminum, painted throughout. The cuddy cabin is a combination of composite materials and welded aluminum and has a pleasing rounded profile. In the bow area, a Maxwell fully-automatic windlass takes care of the galvanised plough anchor hanging off the stainless steel fairlead. Somewhat unusually for a boat, the Sealegs also has halogen headlights fitted – a useful addition when coming ashore in the dark although illegal for use while on the water. The forward cabin is not suitable as an overnighter because the oversize pontoons limit the space available. Squabs provide comfortable seating while hiding a couple of storage lockers underneath. The inside of the cabin is carpeted, with a large hatch that provides access to the anchor locker and an overhead polycarbonate hatch for light and fresh air when required. What the cabin does do particularly well is provide a windshield for the main cockpit. Our photo boat was one of the earlier model Sealegs with a centre console, and the difference in wind effect between the two was quite dramatic. A high glass windscreen assists in deflecting the wind and any spray off the occupants, while a Bimini top and clears could easily be fitted for further protection. The review boat was the prototype model, so not all the trim details were finished. However, what was in place was to a high standard and the seats were wide and comfortably upholstered. The skipper and passenger seats are mounted on gas struts, with bench seats behind them that hide further storage areas. Logical layout We liked the instrumentation, which is well laid out and logical despite the extra controls for the hydraulics. A fantastic innovation is a daylight-visible indicator LED for each of the power plants, so at a glance once can see which of the motors are running. Many boats would benefit from such an indicator, with modern engines often being so quiet at idle it is sometimes hard to know if they are running or not. The boat is powered by two different engines. While on land, a surprisingly small Honda 24hp four-stroke, hidden under the bench seat against the transom, drives the wheels. Thanks to the efficiency of hydraulics, this reliable motor gives ample power to move just over a tonne of boat over rough terrain at up to 10kph. In earlier models the motor was located under the skipper's seat, but in this version it has been moved further back to compensate for the weight of the cabin over the bow area and improve deck utilisation. This new position has the extra benefit of making the whole boat quieter while the auxiliary engine is running. One of the problems with hydraulics is the heat generated but the new, extended runtime technology enables this system to now be run for 30 minutes in the hour. The entire cockpit is self-draining through grates in either corner. A well-designed stainless steel boarding ladder folds snugly over the port pontoon and, when folded out, the shape of this makes it extremely easy to use. A stainless arch does duty as a mounting point for aerials, rod holders, spotlights and anchor light. There is no boarding platform out the back since the wheel mechanisms occupy the full transom width. Power aplenty Once in the water, an Evinrude eTec 150hp direct-injection two-stroke motor does the business. Quiet, light and economical, the Evinrude has one of the highest power-to-weight ratios of any outboard and surpasses all emissions requirements. It proved to have plenty of power on the test day and the underfloor 180-litre fuel tank gives more than enough range for a day boat. Launching the boat was simplicity itself: the Honda started at the turn of a key and we simply drove into the water. Once the outboard was in sufficient depth of water it was started up and the boat continued forward under outboard power with no discernible transition. The wheels were retracted once the boat was floating free and the Honda was turned off. We quickly headed out and had a play in Stanmore Bay. 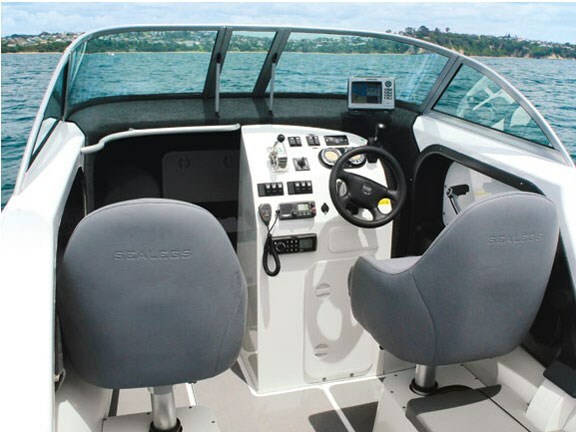 The boat features power-assisted hydraulic steering and this can be turned off at any time. While under outboard power, the Evinrude is very light to steer anyway and by turning off the power assist, we were able to get positive feedback from the motor. It is a testament to the Sealegs engineering that, despite the front wheel continuing to turn in tandem with the motor, the steering remains light even with the power turned off. The boat handles very well, as befits a deep-vee pontoon boat. We tried (and failed miserably!) to get the boat significantly out of the water as it cut easily through the swell thanks to its 21 degrees deadrise at the transom. However, the massive pontoons, which are clear of the water during normal operation, ensure extra stability both at rest and during extreme manoeuvres. There was never any hint of the boat leaning over excessively and the hull felt comfortable at all times. A triangular planing surface under the stern gives the hull efficient lift at speed and counteracts the extra weight of the amphibious mechanism. The engine seemed ideally matched to the hull and it was easy to forget that this boat weighs somewhat more than most boats of this size. The hull's efficiency is aided further by the fact that the pontoons are well clear of the water during normal operation, hence there is no drag from them. Although we did not measure the top speed, we did get to well over 30 knots with power to spare. Home run Driving out of the water was as easy as launching. The wheels are lowered using rocker switches and the little Honda is started. As soon as the wheels touch the ground, the hydraulic drive is engaged and the wheels start to turn. At this point, both motors are pushing the boat. Once the exhaust sound is heard, the outboard is switched off and the boat is now fully propelled by the wheels. The same steering is used throughout and it is not necessary to tilt the motor up to drive out of the water. Once on the beach, it is possible to partially raise any of the wheels (and hence lower them down to ground level) to make it easy to get in or out the boat. Although we did not need a trailer, Sealegs does of course provide this as an option. In reality, these never need go in the water as the boat simply drives itself on or off the trailer as needed. Once on the trailer, the legs are retracted to lower the boat onto a series of rollers. This means that the annual fight against corrosion that afflicts most trailers will be a thing of the past for owners of a Sealegs boat. Historically, one of the major markets for Sealegs in New Zealand is residents of Waiheke Island, where boat ramps are in short supply. But anyone who enjoys boating in remote regions and who wishes to be able to launch their boat absolutely anywhere should consider a Sealegs. This new model brings the amphibious vessels into mainstream boat design, with its larger size and a cabin layout that provides shelter from the elements – factors that are certain to find favour among a larger range of potential purchasers. And of course it is the ultimate toy: can you imagine the head-turning impact of driving one up onto Mission Bay beach on a sunny afternoon to collect a couple of lattes before heading back out for more fishing? I want one!